When are you your most joyful self? Think about it. Is it when you’re alone reading a good book, quietly soaking in the elements around you? Is it when you are surrounded by your favorite people? Is it when you are productively crushing a task? Is it when you are playing a sport or doing some other type of fitness-related activity? Are you indoors or outdoors? For me, my most joyous self is when I’m laughing. My wife knows it. My extended family knows it. My close friends know it. My coworkers know it. I’m a belly-laugher. Different types of circumstances and situations bring that aspect of my personality to the forefront; but the minute I start chuckling, I feel freed from the weights of life. To get myself into a creative space, I need to laugh. I have also learned over the years that sometimes I have to do my best to buck up and try to be my best self even when I am not “feeling it.” The best and most creative moments in my life have come when I have given myself permission to get into a laughing space. Over the years, I have learned to trust that God is the One guiding these moments to shape me and to create moments for others where they can connect with Him. In other words, God uses that aspect of my personality to bless other people. God created your personality and gives you permission to be yourself. Though I have always known God uses laughter, I (occasionally) used to feel like I had to become this “hyper-spiritual” person to be an effective Christian or pastor. Don’t get me wrong… it’s a good thing to strive to grow in Christ (that’s why I’m a pastor!). The thing is… I used to put pressure on myself to be a certain way so I could “look the part” of a solid Christian. Over the years, I have grown to understand that those things happen a lot more naturally when I become the joyful/laughing person God created me to be. I talk to my neighbors more. I am a better person/Christian/husband/dad/pastor/friend/boss. I write better sermons/blogs/make more creative content to bless others. I am more disciplined with exercise and scheduling. I could go on and on about how much better things are for me when I make time and space for laughter in my life. The point is: God created our personalities and wired each of us certain ways to bless the world. So here’s my encouragement to you. God gives you permission to be yourself. If it really is true that God created us, wove us together into our mother’s wombs, knows our thoughts, searches out our paths, and is acquainted with all our ways… I think it’s fair to state that our personality is a part of that. 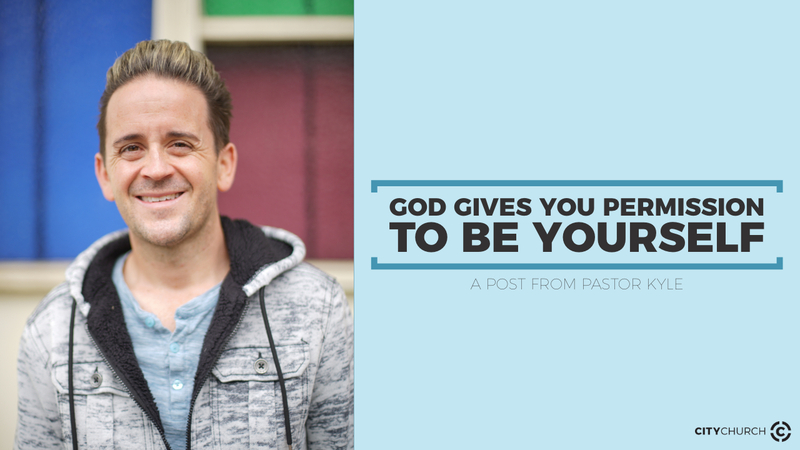 One of the best ways that you will grow in Christ and reach others for His glory is to be yourself. Now, it’s also worth stating that we have a fleshly self and a spiritual self we are striving towards in Christ. When I say “be yourself,” I am referring to becoming the “spiritual self” God wants you to become. So, you can’t be a jerk and go around saying “that’s just who you are.” Instead, I challenge you to identify a few distinctive circumstances/events/situations that bring about your best self and make some space for them every day. When you are the best version of you, you’ll probably be more effective in life and in your faith as well. God gives you permission to be yourself. So what do you need to do to become your best self today? I also feel my best self when I am reading the Bible. When I have my heart, eyes, and ears open to see what the Holy Spirit is trying to have me see, I feel I am able to feel more in tune with my best spiritual self. I believe that God gives us all many skills and talents to use for His Kingdom and when we are able to use them, we are inevitably going to feel the best while performing in those areas. this may be somewhat random, but it seems that I am my most joyful when I am busy around the house doing chores — laundry, dishes, whatever — and singing along to my worship playlist. Most times this happens when my beautiful wife has my beautiful kids out and about, having fun somewhere, so there’s no one around to cringe when I hit a sour note, but occasionally (not often enough) they get to be in the audience and take part. It’s a great thing, and I hope it lightens your heart to know that it was the warm welcome I got from City Church, and the opportunity to volunteer on the production and worship team, that made this a regular feature of my life! God’s blessing to you and our church!